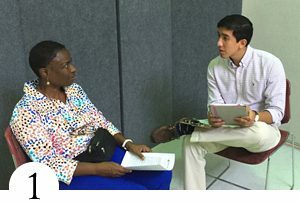 Screening events are held throughout Baltimore City, and are a large part of the recruiting and information collecting process for the SToP Glaucoma study. At each screening, we provide the following free services. This 10 minute interview involves questions about your vision, work and health. Participation in voluntary. 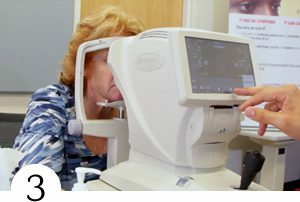 This presenting vision test rapidly determines which participant has poor vision (worse than 20/200), decreased vision (worse than 20/40 but equal to or better than 20/200) or good vision (20/40 or better). 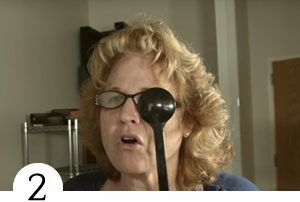 Auto refractor test will identify those who have decreased vision solely due to refractive error. These individuals will be referred for glasses only. 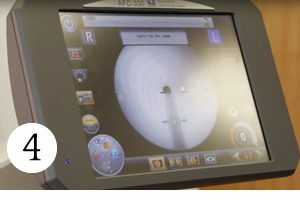 This auto refractor has built-in spectacle correction and therefore can be used to obtain best-corrected visual acuity. Using funds photography, we can obtain good optic nerve images for documenting the presence of absence of glaucoma, and also identify other diseases of the macula and blood vessels. While not part of the definition of glaucoma. Eye Pressure is a key risk factor for the disease and nearly half of those with glaucoma have eye pressure above the normal range. The Icare tonometer that will be used in this project is a handheld portable device that accurately measures IOP and does no require anesthesia. Characteristic patterns of visual field loss are part of the diagnosis of glaucoma. 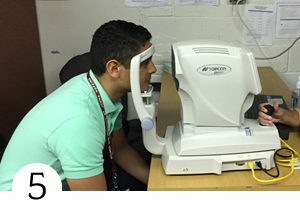 This side vision test is used to map a patient’s response to visual stimuli presented in various locations within the visual field.